Sixth-grader Quincy Stover takes part in a practice online session while preparing for the Partnership for Assessment of Readiness for College and Careers tests at Fort Logan Northgate School in Sheridan in March. Test results are now in, and Durango School District 9-R students performed above-average in the state on English/language arts. The results from the first go-round of testing on Common Core standards have been issued, and Durango School District 9-R students consistently surpassed state averages on language arts. Math scores will be trickier to interpret. The larger question is whether being above-average in Colorado will be enough for 9-R students to meet the higher 2021 graduation standards 9-R’s board has been setting. What will it take to increase the learning for students who didn’t meet or only partially met the standards? 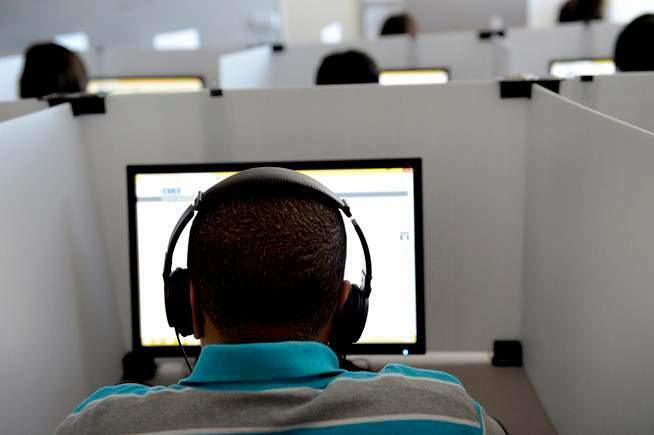 Between 30 and 40 percent of students were close to hitting the mark in both subjects. What kind of additional help will bring them up to par? Among the student population are kids studying English as a second language and students who are intellectually or developmentally disabled, who are unlikely to ever meet standards. Those questions are part of a continuing discussion within 9-R. The Partnership for Assessment of Readiness for College and Careers was administered in March to third- through 11th-graders. Durango School District 9-R made the decision to test students on English/language arts by grade level, but on math by course level. Many of the districts in the state had students take the math portion by grade level, he said, so in his example, averages may be skewed both on the seventh-grade and 10th-grade scores. 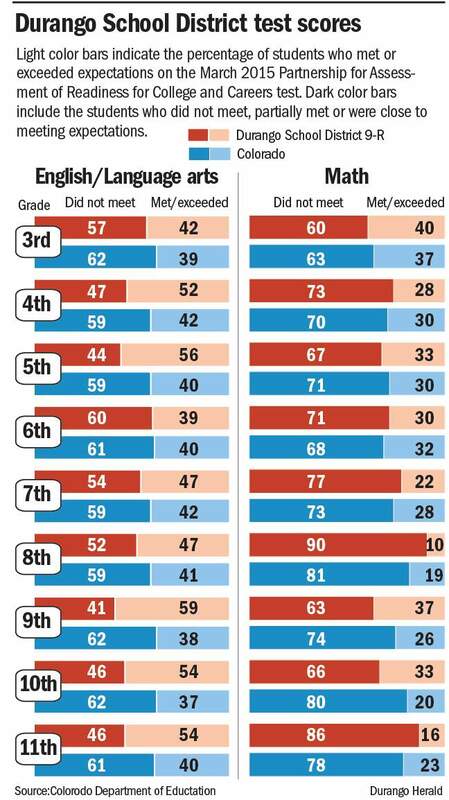 On language-arts, 9-R’s students exceeded state averages, often by significant levels. Durango and Big Picture high school students, in particular, outshone their statewide counterparts, with up to a 21 percentage-point difference. The test results are limited in what they can tell the district. The results are being dialed down to the school and classroom level, he said. The district’s seven elementary schools will be seeing how their results compare with each other. There were gaps in performance at all levels for minorities and students who qualify for free or reduced lunches, he said, and the gap widens as they progress to middle and high school. That is a challenge for all school districts, and 9-R continues to work on methods to address that gap, such as bringing some social services into the schools. The 2015-2016 school year PARCC test, which will take half the time, will be administered in April, closer to the end of the school year when students will have another month of learning under their belts.